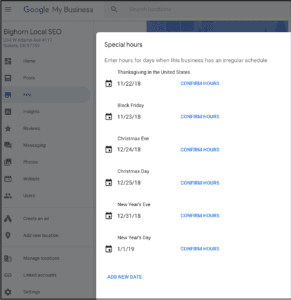 Does your business have different business hours on the upcoming Holidays? 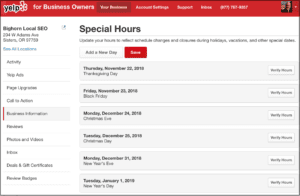 If so, you’ll need to update your hours on each of your primary local/social business profiles. The good news is that Google, Yelp, TripAdvisor, and Facebook make it super easy to do. I just updated my business hours on Google & Yelp. It took 1 minute. Just log in, click on Business Information, then scroll down to Hours where you’ll see “Special Hours”. Click and edit! You can edit each upcoming holiday. This is imperative if you are a retail business. While signs on the door are nice, and Google & Yelp may alert folks in advance that hours might not be as listed…but you don’t want to disappoint any of your customers – especially on Christmas Eve. I wrote a blog post about this last December after such a disappointment with a restaurant on the Oregon Coast. It seems lots of folks just think a crappy sign on the door is all you need. Hmmm. It’s helpful if you have the business owners apps on your phone so you can manage listings anywhere, anytime. If you get lost with this, give us a call. We’re happy to help you!